Nationwide tuition debt now tops $1 trillion – surpassing credit card debt as the biggest source of unsecured debt for Americans. That staggering figure has prompted the U.S. Education Department and the Consumer Financial Protection Bureau (CFPB) to team up to help students and their parents better understand the true cost of college. On Monday, Secretary Arne Duncan unveiled a standardized ‘Shopping Sheet’ which breaks down the total estimated annual costs (tuition, fees, housing, books and supplies, transportation, and other expenses) as well as what options are available for repaying any loans a student takes out. The Shopping Sheet comes as campuses in the UNC system will be raising tuition and fees an average of 8.8 percent for the 2012-13 school year. 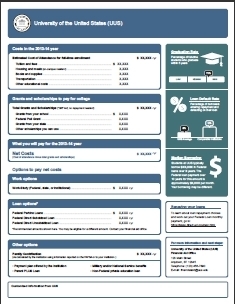 The Education Department is hoping the easy to understand worksheet is adopted by colleges and universities nationwide as part of their financial aid award packages starting in the 2013-14 school year. To download a pdf copy of the Shopping Sheet, click here.